Candied violets…yummy. 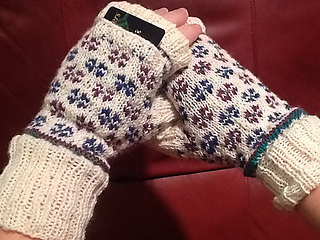 That’s what these mitts look like to me…so soft and feminine. The pattern includes sizes for teen and woman med. Fun to knit. So yummy, you’ll want to eat them…well, maybe that’s just me…Now you see it--now you don’t! 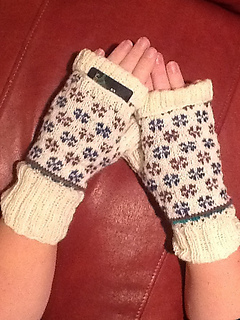 These terrific mitts have a secret pocket that is hidden to protect your valuables while you use your hands. Wool makes these super warm. Top can be unfolded to cover fingers, or folded down to cover pocket and expose those texting fingers. Layer over gloves for extra warmth and a nifty look.